In framing the chapter with the long-term artistic relationship between director Deborah Warner and actor Fiona Shaw, the chapter centralises Patrice Pavis’s notion of the ‘double’. 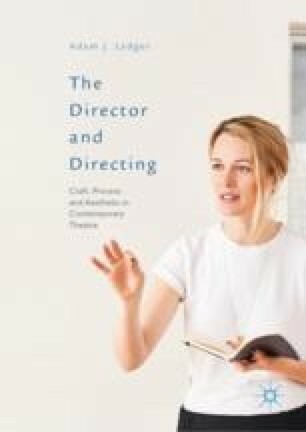 It argues that in its primary relationship to the actor, directing can be understood as a practical transaction of skill, as well as how the director is ‘doubled’ severally as a multimodal practice. The chapter particularly draws on the work of Ariane Mnouchkine, Robert Wilson, Thomas Ostermeier, Ivo van Hove, Emmanuel Demarcy-Mota and Declan Donnellan, assessing how their creative processes can be understood through how each positions the ‘double’ of their actors. The chapter considers, variously, the neuroaesthetics of emotion, sympathy and empathy, the theory of mind, brain structures and concepts, as well as the appreciation of the body in performance. The chapter concludes that in the director–actor relationship, each provides the ‘look of the other’ as a fundamental creative praxis.